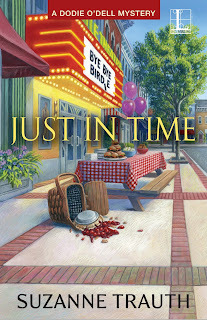 Leave a comment below for a chance to win a signed paperback of JUST IN TIME! Yikes! Some days my life is really hectic. As manager of the Windjammer restaurant in Etonville, New Jersey I have my share of mayhem, soothing chef/owner Henry’s constantly ruffled feathers and riding herd on my staff. Not to mention promoting theme food nights with the Etonville Little Theatre tied to each of their productions. About JUST IN TIME, 4th in the Dodie O'Dell Mysteries: Business is humming at Dodie O'Dell's Windjammer Restaurant, where she offers theme menus connected to the Etonville Little Theatre’s amateur productions. This June, the theatre is collaborating with the neighboring Creston Players to stage Bye Bye Birdie under the stars—their first musical! There's a contest in the play to pick a fan to receive rock idol Conrad Birdie's last kiss before he ships off for the Army, so Dodie plans a contest to pick the food for a pre-show picnic. Suzanne Trauth’s novels include Show Time, Time Out, Running Out of Time, and Just in Time. Her plays include La Fonda, Françoise, Midwives, Rehearsing Desire, iDream, Katrina: the K Word, and Three Sisters Under the Hood. Her screenplays Solitaire and Boomer Broads have won awards at the Austin Film Festival, among other contests, and she wrote and directed the short film Jigsaw. 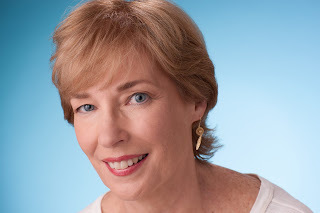 She is a member of the Dramatists Guild, Mystery Writers of America, and Sisters in Crime. Visit Suzanne at her website, on Facebook, or on Twitter. I wish someone had given me advice on several things in my life, but that did not happen! This series sounds like I will enjoy reading it. Thank you for the chance to win this book. You are welcome! Glad to have you reading! My maternal grandmother was full of good advice. The one I hated the most was " you need a vocation, not an avocation". I took 4 periods a day of music in high school. I play 4 instruments (not these days though). She felt that there was no future as a musician. I ended up working a full time job and doing an evening gig 2 or 3 nights a week at a club in Greenwich Village in NYC. Wow! Great story! That was good advice...thanks for reading. Yes! That's what I am doing now with my Dodie O'Dell mystery series. Great advice! Hope you are enjoying your retirement. Yes, I've had someone that I thought I knew inside and out, considered to my sister by choice, that I found out that I didn't know at all. This was someone that we shared everything with each other, the person that I went over and cooked a meal for because I knew she had company coming and a big event at work at the same time, and someone I looked to when flustered about something or something worried me. However, when our 17 year old daughter, our only child, was killed in a car accident, she just disappeared. Didn't see or hear from her for months only to be told later that she didn't know how to handle it. Well, hell's bells neither did I! Although we communicated later on, things were never the same. We both moved on. From this, I give advice that to be there for someone. Take their lead. Let them vent, cry. laugh - just be there for them. On the other hand, someone long ago who I thought wasn't headed anywhere finally listened to some wise advice from a teacher and became not only a well respected contributor to our community but also mentored kids with similar outlooks showing them that you can make a choice for the good. Very proud of this young man! Best advice I got was "Go with flow, but don't be afraid to swim upstream". I took it to mean don't let the little things bother you, but be adventurous, creative and not scared to stand out in a crowd. I still try to live this way. Thanks for the chance to win a copy of "JUST IN TIME". Can't wait for the opportunity to read it. My mom gave great advice. Since I haven't e a chronic illness (MS) I get lots of unsolicited advice from people! Your friend sounds like my character Aunt Maureen in Just in Time! A coworker always kept to himself, never interacting with the rest of the staff. When we were allowed to donate vacation time to another coworker who needed it for a medical emergency in her family, he generously donated ten days. Selfless acts like that are always amazing...and sometimes surprising. Best advice I ever got came on the golf course when I was a teenager, but it applies to pretty much everything: Keep your eye on the ball, and follow through! Not that I can remember at this moment. Nothing that I can recall right now. This sounds like an interesting book. I'm looking forward to reading it. Not that I can recall. Your book looks really good. Thanks for the chance to win! My mom gives great advice. I wouldn't consider it curious tho. She's the one I go to when I need to talk out plans, thoughts, etc. I do wish that I started listening to her advice at an earlier age. I have never been given any curious advice. Makes me think about every time I use "but" when writing...! I received plenty of advice from my parents, but I can't recall any curious advice being given. This book sounds interesting and I'm looking forward to reading it. Fun post! Thanks for visiting! I thought I was following good advice but that's all water under the bridge, you might say. Things change and not always for the better. Congratulations to our winner, Deb Price! And thanks to all for joining in the fun.